Available for purchase on March 7, 2017. Click on photo to order in hardback or eBook. Imagine yourself alone in the wilderness holding two lawbreaking suspects at gunpoint. No onlookers, no backup. Just you in the dark, in the middle of nowhere, with suspects who would cheerfully kill you if they thought they could get away with it. 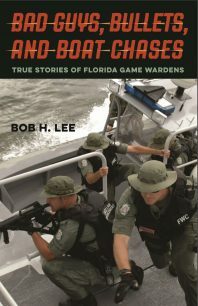 Veteran wildlife officer Bob Lee takes readers deep into the days and nights of Florida game wardens in Bad Guys, Bullets, and Boat Chases. 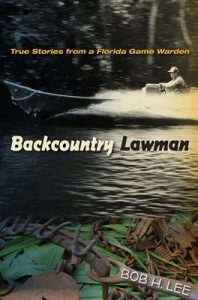 Some people might think all these officers do is check fishing licenses, but this book tells a very different story. Shoot-outs. Survival. Rescue. Powerboat chases. Tracking black-market gator poachers, jumping through truck windows, shredding boat propellers on underwater logs, trapping airboats in wild hog muck, ferrying crates of baby sea turtles, hunting for missing persons in remote areas, getting stuck under a 500-pound all-terrain vehicle at the bottom of a sinkhole—these are just some of the situations game wardens find themselves in. And beyond the action and excitement, the highs and lows of a wildlife officer’s job would test the mental limits of even the bravest adventurer. In these stories, a rookie game warden works to rescue survivors of a jumbo jet crash in the middle of a cold winter swamp; an experienced trapper leads a challenging search for a rogue gator after a tragic attack; a vigilant warden saves troubled persons from death in the wilderness; and a dedicated lieutenant helps a deer poacher turn his life around. From Live Oak to the Everglades, from the cattle ranches west of Lake Okeechobee to the inshore fishing grounds of Pine Island, these amazing experiences span the state. Discover the excitement, dangers, and disasters that game wardens face every day on the job. Published on March 12, 2013. Click on photo to order. In the underbelly of Florida, hardened poachers operate in the dark, out of sight and away from residents who sleep soundly through the night. But poachers are not the only midnight hunters. In the state’s public wilderness tracts, cattle ranches, and water courses, wildlife thieves are stealthily and silently tracked. Most people have never imagined the often dicey, comical, and sometimes bizarre job of a Florida game warden. Backcountry Lawman tells what it’s like to catch an armed poacher in the act–alone, at night, without backup or a decent radio to call for help. These stories describe the cat-and-mouse games often played between game wardens and poachers of ducks, turkeys, hogs, deer, gators, and other species. Few people realize that “monkey fishing”–electrocution of catfish–had the same outlaw mystique in the rivers of Florida as moonshining once did in the hills of Georgia and Tennessee. About the Author–Bob H. Lee is a retired lieutenant and thirty-year veteran of the Florida Fish and Wildlife Conservation Commission (FWC). 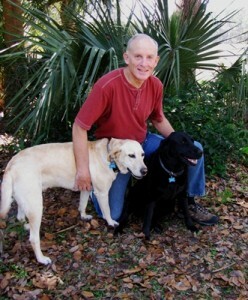 Prior to his retirement in 2007, he taught man-tracking through the FWC Academy. He lives with his wife, Karen, in northeast Florida, along with a menagerie of animals: Dandy, the miniature horse; Dixie, the Labrador; Jesse, the Nigerian Dwarf goat; and Nervous Nellie, a wild pig who wandered into the pony’s pen one night and never left.